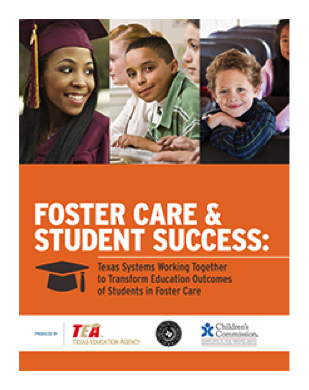 TEA developed a premier resource to support Texas schools in addressing the education of students in foster care: Texas Foster Care & Student Success Resource Guide (PDF). This guide is the product of collaboration with the Texas Department of Family and Protective Services, the Supreme Court of Texas, and the Permanent Judicial Commission for Children, Youth and Families (Children's Commission). This e-guide and training manual contains a variety of key researched-based topics and calls attention to important matters related to the education of students in foster care. The guide promotes best practices and contains numerous tips, tools, resources, and links to more information. Sharing the housing of other persons temporarily due to loss of housing, economic hardship, or a similar reason. Children and youths who have a primary nighttime residence that is a public or private place not designed for, or ordinarily used as, regular sleeping accommodations. The term unaccompanied youth includes a youth, not in the physical custody of a parent or guardian. This would include runaways living in runaway shelters, abandoned buildings, cars, on the streets, or in other inadequate housing; children and youths denied housing by their families (sometimes referred to "throwaway children and youths"); and school-age unwed mothers living in homes for unwed mothers because they have no other housing available. The McKinney-Vento Act is the federal law reauthorizing the Stewart B. McKinney Act that governs the education of children and youth in homeless situations. This act was signed into law in January 2002, and was effective July 1, 2002. Immediate Enrollment – The right to be enrolled immediately in school, without immunization or academic records, and birth certificate, regardless of district policy. Transportation – Students in highly mobile or homeless situations are entitled to transportation to and from the school of origin, if it is feasible, in the student’s best interest, and requested by the parent, guardian, or unaccompanied youth. Services – Students experiencing homelessness are entitled to the same programs and services that are available to other children in the District, such as gifted and talented education, special education, vocational education, English Language Learner services, and tutoring. Students are automatically eligible for Title I services and Districts must set aside funds as necessary to provide services. Students who are experiencing homelessness have the right to attend school in their school of origin or in the school in the attendance area where the family or youth is currently residing. School of origin is defined as the school in which the child/youth was enrolled when they became homeless or the school in which the child/youth was last enrolled. The campus a child attends is determined by which campus can serve the best interests of the child. In Texas, a student experiencing homelessness may enroll in any district they choose, regardless of the location of their residence, school of origin or attendance zone campus.